Yesterday at The Gathering, I talked about "Following Jesus." At the end of our time, I told you that deciding to follow Him is one of the most important decisions you can ever make. This email is a short follow-up from that message. Below are five practical things you can do every day to help you follow Jesus. Just as you have daily habits which sustain your physical life (breathing, eating, moving, etc. 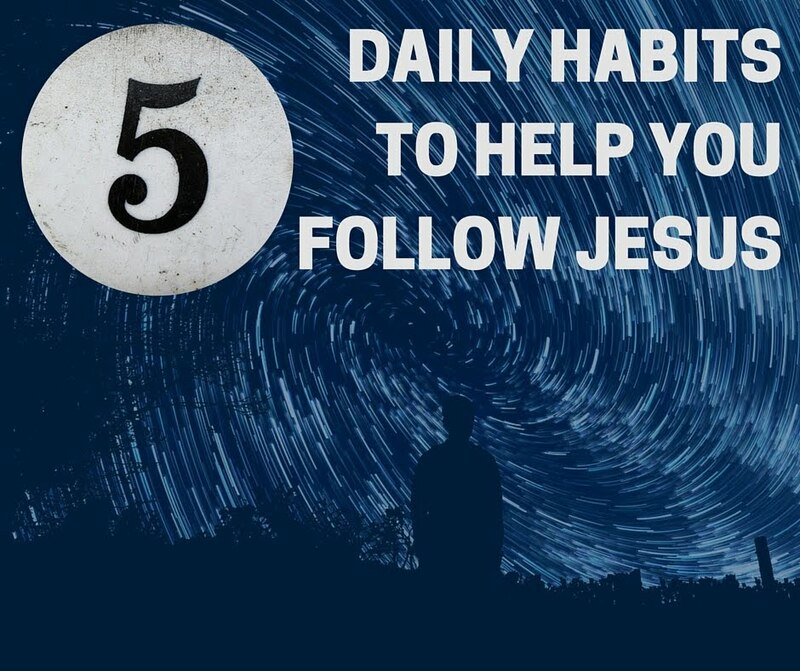 ), these are spiritual habits which will sustain your relationship with Jesus. Please take a moment and consider whether or not these five simple activities might make a difference in your life this week (and beyond). Set aside time every day to study the Bible. As you become more proficient, you may want to set aside more time. Don’t overload yourself in the beginning. Keep a “SOAP” journal because there will be an opportunity to write your thoughts everyday (you can use a word processor, journalling app or the Bible App from YouVersion). S – SCRIPTURE: Read your chosen scripture passage aloud so you can hear it. Begin by writing every word of the scripture in your journal. Both reading it aloud and writing it will help put the scripture in your mind and heart. O – OBSERVATION: Ask yourself the question, “What does this passage teach about God's character?” As you ask yourself the question, your mind will be full of thoughts. Write those thoughts down. Try not to focus on yourself right now, keep your mind on what you can learn about your God and Jesus. A – APPLICATION: Ask yourself the question, “How does this scripture apply to my life?” Look for promises to claim, attitudes to change, challenges to accept, sins to confess, commands to obey, actions to take, examples to follow, or skills to learn. Write in your journal how the scripture applies to you and to your life situations. P – PRAYER: Write a prayer to God. Depending on what you have observed, your prayer might be one of praise and thanksgiving or a prayer asking God to help you apply the teaching to your life. You might feel compelled to write a prayer of confession. This is your prayer to God. The discipline of writing your prayer is important piece of connecting with God. Following Jesus means giving like He gave. He gave His entire life away for us. When we give things away, we are loving like Jesus did. Try to give one thing away every day. It may be a small thing or a large thing. It may not cost you much or it may cost you little. Whether you are giving away possessions, money, time or attention; developing generosity is an important step on the road to Christ-likeness. Jesus called 12 apostles to follow Him so that after He left they would still have one another. The Bible says much about how we can help one another to grow closer to Jesus. We are to encourage one another, bear one another's burdens, pray for one another, teach one another and more. Find a way to connect with at least one other Christian at least once every day. You might sent each other emails with Bible verses or encouraging text messages. You might grab coffee together with 2 or 3 others or you might spend a few minutes on the phone. At least once a week, try to connect with a larger group (like a LIFEgroup) for prayer, discussion and encouragement. As Hebrews says, "Don't neglect assembling together..."
I mentioned on Sunday that Jesus' followers always talk about Him. You can make an eternal impact on those around you by pointing them to God. Every conversation you have doesn't need to be a religious debate, but as you get to know people they should see your love for Jesus through the conversations you have. Try, at least once a day, to say something to someone about your faith. You can tell them how God has blessed you, you can tell them about a verse you read, you can tell them about a neat experience you had at church, you can talk about something you heard in the sermon or you can tell them about your favorite worship song. Somehow, find a way to talk about Jesus every day. Don't go to bed without saying "thank you." As you lay down at night, spend a few moments to be grateful to God for all He's done for you. Before you sleep, consider how God's hand was providing for you and protecting you all day long. Stephen Covey said, "We make our habits and then our habits make us." Commit yourself to these daily habits and you will be surprised how they change your outlook and your life. Following Jesus makes all things new because when we follow Him, He changes us from the inside out.